The Passion seems to me a quintessential horror film, a visceral cinematic assault which is no more or less ‘Christian’ than Ken Russell’s The Devils or Abel Ferrara’s Bad Lieutenant. All are examples of extreme movie-making from flamboyant film-makers who are passionately obsessed with the mysteries of Catholicism. He also notes that in the credits we find make-up effects stalwarts Keith Vander Laan and Greg Cannom, horror graduates who honed their skills on shockers such as the vampiric epic Bram Stoker’s Dracula and the grisly modern-gothic chiller Hannibal. I was also interested to see elsewhere that Benedict Fitzgerald, who worked with Gibson on the script, provided the screenplay for Wise Blood, a brilliant piece of Southern Gothic from John Houston that had the great Brad Dourif (Lynch movies, Wormtongue) playing a very disturbed atheist preacher who sets up “the Church of Christ without Christ”. Meanwhile, the book-of-the-film has been put out by Tyndale House, an odd choice as Tyndale’s Left Behind novels have been described as anti-Catholic by the Roman Catholic bishops of Illinois. Other movie tie-ins include nail pendants, the inevitable T-Shirt and a jewellery line from the man who brought us WWJD bracelets. Passion composer calls Devil: but will he come? I had all these computers and synthesizers in my studio and the hard drives would go down and the digital picture that lives on the computer with the music would just freeze on his [Satan’s] face. Then the volume would go to ten and it would happen all the time. He didn’t manifest himself, but I wished he would have. It changed for me after that. I want to kill him. I want his intestines on a stick. I want to kill his dog. Today’s big news where I live (Japan) is the sentencing of Chizuo Matsumoto, better known as Shoko Asahara, the man who promoted nihilistic religious terrorism before it was fashionable. The epic trial (during which arrests were made in Russia of followers reportedly planning a rescue mission) ended, as was expected, with the death sentence, although with the appeals procedure about to get underway it’ll be many years before we get to see The Passion of Shoko Asahara. Asahara’s group, Aum, now rebranded as Aleph, is a tiny, despised sect, with not many future prospects…sound familiar? Members of the cult, who had not demonstrated violent tendencies before they joined Aum, were fed a diet of violent apocalyptic teachings. What, like Left Behind and The Late Great Planet Earth? The two big religious news stories of the day, the release of The Passion and Bush’s War on People Different From Him Getting Married, have been covered in depth everywhere else already. I’ll just briefly note the crowing in Charisma magazine over Bush’s move, and point American readers in the direction of this report concerning the London Partnerships Register, set up Ken Livingstone, Mayor of London. If anyone wants my own views, I knew a gay couple in their fifties in London who had been together twenty years. When one died, the widower (they had had a religious wedding ceremony) had less rights than the deceased partner’s other relatives. This meant that the widower was overruled on the burial arrangements and had to fight a legal battle to keep his house. How this situation served the protection of civilisation is rather baffling to me. Unlike many academicians who write at a tedious college-reading level [! ], Wagner is a populist who tries to reach average laypeople. None of his books ever hit a best-seller list, but total sales of all his titles is more than 2 million copies. Considering that many of his books are used in seminaries, Bible colleges and independent church-training centers and are available in 25 languages, Wagner’s impact seems staggering. Indeed, and someone like Wagner deserves as much attention as the likes of Pat Robertson – perhaps more so. Wagner’s major contribution to humanity is his views about Spiritual Warfare and its relation to the “10/40 Window”, the area on the world map which covers North Africa, the Middle East, China and South Asia. These areas are the most resistant to Christian conversion, and Wagner reasons this can’t be because the people living there simply have their own way of life which they prefer: it must be because of “Territorial Demons”, which needed to be overcome by what amounts to exorcisms of whole countries. Wagner managed to gain prominence by harnessing an interest in demons created by This Present Darkness, a Fundamentalist novel in which demons try to control the inhabitants of an American town by teaching its inhabitants about environmentalism and Eastern religions. Also, with the revelation that so many “I survived Satanism” books were fraudulent, Wagner provided an alternative view that was just as black and white but required less evidence. At one point, he was teaching at Fuller Theological Seminary and his ideas were being vigorously promoted through his friend John Wimber in both the USA and the UK, with Wimber’s books providing a chunk of the reading material on the Alpha Course. Wagner’s influence has peaked now in the West, as has the Charismatic movement, which provided a way for conservative Protestants to ease themselves out of their rather dour sub-cultures into something more cheerful (see Steve Bruce). Wimber is no more, and the Alpha course has been de-Wimberised. Charismatic “Spiritual Warfare” is also less popular following several sexual abuse scandals. Also, by providing a supernatural explanation to explain why Charismatic ideas are failing to spread more successfully, Wagner keeps members of the movement busy with stuff irrelevant to actually getting converts. However, the “25 languages” part above shows where Wagner’s legacy really lies: in Africa and parts of Asia where an indigenous and heavily-supernaturalistic Charismatic movement really is going from strength to strength. Christian China to convert the Middle East? A couple of months after the event, I come across an interview with David Aikman, author of a widely well-recieved book on Christianity in China, Jesus in Beijing. Aikman’s book is one of a number that have emerged recently on the spread and development of Christianity worldwide, in the wake of Philip Jenkins’s The Next Christendom. Both authors rightly draw attention to a huge cultural shift underway which has gone grossly unreported in relation to topics such as radical Islam. This is not to say that no-one noticed what was going on before; however, some older books on the subject tend to stress the “American Hegemony” aspect of the subject, especially in relation to Pentecostalism. David Martin, in his recent study of global Pentecostalism, crows that this approach (which criticised his work) has now been dropped completely. I think Martin is too dismissive here, but the model did have serious limitations. If Christians began to fill positions in China’s foreign ministry, strategic think tanks, and even high places within the government as a whole, China would become far less opportunistic about supporting any Middle Eastern group that happened to be critical of, or hostile to, the U.S. In addition, if China ever became open enough to be willing to permit Chinese missionaries to travel overseas, it would probably be supportive of efforts of Chinese missionaries to evangelize the Islamic world, especially the Arab Middle East. This, of course, would render China far less popular in the Muslim world as a whole and thereby far more likely to try to be “even-handed” in the Israeli-Palestinian dispute…China’s Christians tend to be very pro-American. They tend to support the war on Iraq and Washington’s support for Israel. They greatly admire U.S. religious freedoms and the vigorous functioning of democracy. Most are not naïve about American social and cultural shortcomings. A lot of “ifs” here. With no sense of a time scale, we have Christianity being tolerated more, Christians getting into positions of power, to China deciding to follow an aggresively Christian foreign policy, even if that means dropping Middle Eastern allies. Aikman compares China to Rome during the time of Diocletian, when the final persecution ended with a Christian Roman Empire under Constantine in a very short space of time. This is all possible, and a democratic China would of course be a good thing both for the Chinese and for the world. But why should Christianity and democracy go together? After all, the Christian Chinese nationalist leader Chiang Kai-Shek was hardly a good example. And the excessively authoritarian shepherding movement in the USA (which even Pat Robertson didn’t like) owes its origins to cell churches in China. And even if China decided that missionising the Muslims was a number-one priority and to hell with the oil, would they actually be able to? Beyond this wishful thinking there is also dishonesty. Why are Chinese Christians so supportive of Israel? Probably for much the same reason that many Western Christians are: because God wants Jews to live in an expansionist state and provoke an apocalyptic conflict during which Jesus will return. How a Chinese foreign policy based on such premises would be either “even-handed” or helpful for anyone is somewhat unclear to me. But then, Aikman also provided a foreward for George Otis’s The Last of the Giants: Lifting the Veil on Islam and the End Time, a book with a take on the Middle East that combines Hal Lindsey will General Boykin. On the back cover Aikman uses his status as a senior correspondent at Time magazine to promote the argument that demons control people through Hinduism, materialism and Islam. Mel Gibson, Jim Caviezel in “Satanic Attack”? So much has been written about Mel Gibson’s movie version of Anne Catherine Emmerich’s The Dolorous Passion of our Lord Jesus Christ that I didn’t think I would have much to add, except my hope that its Aramaic dialogue might at least make people curious about Syriac, a dialect of Jesus’s language still spoken by Assyrian Christians from parts of Turkey and Iraq (although now in decline). There are strong non-Christian movements which have arisen in recent days who are extremely hostile towards the Gospel.There are lies being circulated among the media pertaining to the film. And there are even special interest groups among “Christian” leaders who are trying to remove certain aspects of the movie to better align themselves politically which would remove significant truth from the movie. Caviezel and Gibson have faced death threats, and this is all, of course, a plot from Satan. As ever, one looks for confirmation for these dramatic statements from some creditable source. A couple of sites devoted to “prayer requests” carries the same email, one attributing it to Rod Handley. This seems to fit: Handley was working at Washington University at the time Caviezel was there, but it’s odd that this name is not included on the email forwarded to me or on the only other on-line source. The email also claims that when asked by his friend what he had learnt by playing Jesus, Caviezel had replied “Two words: Unquenchable Fire”: an enigmatic quote which appears to have been lifted from an interview he gave to CBN. So, what is this “significant truth” that will be taken out of the film? If it’s so important, why doesn’t the email writer tell us what it is? And who are the mysterious “strong non-Christian movements”? Could be something completely innocent. Or it could be an anti-Semitic reference to deicide and Jews. The email contains a couple of other odd claims. One is that the film is “not allowed” in France. I can find no reference to this at all anywhere else – indeed it seems that the film is opening there in April. I assume the current anti-French climate, along with reports about how France views religion has led to the belief that Robespierre has risen from the grave. The other odd statement is that Aramaic, being widely spoken among Muslims, will show them “The Gospel”. This is not quite right, although Aramaic, Arabic and Hebrew do have a number of words that are mutually comprehensible. French cinema chains are refusing to distribute or screen Mel Gibson’s controversial film The Passion of the Christ because of fears that it will spark a new outbreak of anti-Semitism. France is the only European country where there is still no distribution deal for the film. Tarak Ben Ammar, a major film broker with business ties to media tycoon Rupert Murdoch and Italian Prime Minister Silvio Bersluconi, told interviewers the film stressed forgiveness and blamed the Romans rather than the Jews for Christ’s death…Ben Ammar, who produced Franco Zeffirelli’s “Jesus of Nazareth” and Roberto Rossellini’s “The Messiah” in the 1970s, has also been involved in the production of such popular films as the “Star Wars” and “Raiders of the Lost Ark” series. 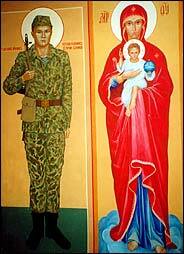 Rodionov is on fast-track to popular canonisation, despite some church resistance, and his icon has become popular among soldiers. Perhaps the story of Rodionov’s murder is just as Fr Shargunov tells it, and a Chechen is quoted supporting the account. However, one wonders if the story has been embellished on stereotypical lines. The Brothers Karamazov contains an account of exactly the same story (Book III, Chapter 7, “Disputation”), set somewhere in Central Asia. The notes to my edition (Pevear and Volokhonsky 1991) state this was based on a true event which Dostoevsky mentions in his 1877 Diary of a Writer. Of course, a Holy Martyr in Chechnya is just what’s needed now to stop Russians questioning what Russia is actually doing there in the frst place. UPDATE (18 June): Shargunov reappears today. A news item from the British Sunday Mercury (serving Birmingham) reports that serial killer Fred West was involved with the occult. The source for this revelation? “Renowned Irish author Jim Cairns”, according to the hack concerned. Renowned? Unlike the hack, who gets paid to do this sort of stuff, I spent about ten minutes on-line to find out who this distinguished source really is. Alarm bells went off very quickly. According to Cairns, just about every missing person in Ireland has been abducted by secret Satanic coverns for sacrifice. And who are the Satanists? Among others, the prime movers are, er, Evangelical and Charismatic Christians, whom he insists on calling “Born Agains”, and who he seems to think of as one controlled movement. And who are their leaders? Er, George W. Bush, apparently. Cairns, who is a great fan of David “Queen Elizabeth is a giant lizard” Icke, also goes on at rambling length about the CIA, paramiliataries and people he has fallen out with over the years (including his ex-wife). The report then goes on to back Cairns up with mention of Valerie Sinason, a psychotherapist advocate of the existence of Satanic Ritual Abuse, without noting the many critiques of her methods and ideas, such as Jean La Fontaine’s work. Although, about 20 paragraphs down, there is a mildly sceptical response from Dr Peter Maxwell-Stuart of St Andrew’s University, the newspaper raises Cairns to a level of respectability. Never mind that Cairns preys on our natural bewilderment of West’s evil to spread unnecessary fear and suspicion. Never mind that he puts the families of missing people through unnecessary torments. Never mind the damage done to serious efforts to counter child abuse and other crimes. Just in case people wonder, there are at least four people I am not. I am not Richard Bartholomew the JFK and 9/11 conspiracy theorist from Texas. I am not Richard Bartholomew the political cartoonist. And I am not Richard Bartholomew, author of books on India. I am also not Brother Bartholomew, the Satanic Catholic leader in Salem Kirban’s apocalyptic novel 666.